It’s Christmastime in Jubilee, Texas, but Lissette Moncrief is having a hard time celebrating . . . Especially after she accidentally smashes her car into Rafferty Jones’s pick-up truck. Yes, he’s a whole lot of handsome-from the tips of his boots to the top of his Stetson. But he’s no Christmas present. Lissy’s not about to let herself get whisked away by his charming ways and words . . . only to watch him drive away in the end. But what Lissy doesn’t know is Rafferty’s in town just to meet her-and to give her a share in a windfall that doesn’t rightly belong to him. At first, he just wants to do his good deed and get out. But one look at this green-eyed beauty has him deciding to turn this into a Christmas to remember . . . making promises he’s determined to keep-whether she believes in them or not. When I originally signed up to be on this book tour I was on a huge romance novel kick, which coincidentally always coincides with my period, and I kind of forgot about it. Then I got it in the mail and was like, oh... 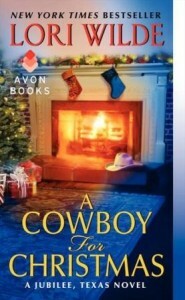 I hope this isn't one of those hokey romance novels where the woman just loses her breath when the cowboy whips a cow and and down on the farm loving. Oh stop it, you know I'm judgey like that. Fortunately, this turned out not to be like that at all and I totally loved it, finished it in the afternoon and really can say I'm a Lori Wilde fan after one book. What I love is that Lissette is not a wussy. She's a recently widowed mother of a son who she just finds out has a disability where he'll eventually become totally deaf. Which, single parent or not, that's a tough lot to handle. Her husband dies in combat and even though he wasn't the stellar husband she thought he'd be towards the end, it's still a rough situation. Then comes long lost half brother of her dead husband, Rafferty, and he just wants to do right by her and bam- it's kind of a tense situation but it obviously turns romantic. But what I like about it is that it was actually kind of realistic. Sure, the chance of a widowed mother of a partially deaf child falling in love with her husband's long lost half brother in a few short weeks maybe isn't the most realistic, but it's better than some of the novels out there. And none of it was over the top, everything felt normal and not overly dramatic and it was just a really great book. I thought the ending with Rafferty was kind of ironic because he is portrayed as this guy who's always trying to do good by others and save others and becomes a victim himself, but I loved how there was that final twist so not everything is as smooth as some romance novels will have you believe. So I loved it. It's a fun read, it's a fast read, and I think you'll like it. Check out Lori's website HERE, her Facebook HERE and follow her on Twitter HERE. I know what you mean about hokey romance novels. I'm glad this isn't one of them! TA DA! Awesomeness and a contest for YOU. Impulsive Sara and Sara on a rampage. Maybe I won't be chunky forever. Laundry room update: DIY gone bad.